All Residents of Sherwood Manor can receive 40% off Telus Home Services or Exclusive Deals with Shaw!! *See site manager for details. Location, location, location!! Walking distance to restaurants, fast food, shopping, banks and even Walmart!! Sherwood Manor features secure entry and on-site laundry, nestled in a residential area of the beautiful City of Sherwood Park. With your choice of spacious suites, Sherwood Manor is the perfect home. Just off Wye Road & Sherwood Drive, you are minutes away from Whitemud Drive and the Anthony Henday you will have no issues getting to work or play while commuting. Storage lockers available to rent! Heat, water & one parking stall included. Sorry, no pets. Security deposit is only $499! Beautiful 1 Bdrm w/ In-Suite Laundry & Balcony in Sherwood Park! BRAND NEW 2 Bd /2 Bath w/ Suite Laundry in Sherwood Park! 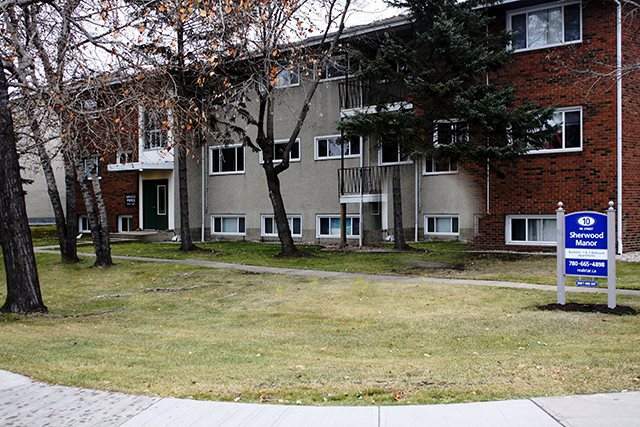 Beautiful 2 Bdrm, 2 Bath w/ In-Suite Laundry in Sherwood Park!